Until further notice, due to a public safety hazard of tree failures within the campsite, Pyramid Campground is closed. Not all yearly trail assessments have been completed on the trails. Hazards including windfall along trail and dead standing trees near backcountry campsites and other developed facilities may be encountered along these trails. Cathedral Protected Area was established on April 18, 2001, to enhance the ecological viability of Cathedral Park and to protect low elevation forests. This small protected area is an addition to the existing park. The new area provides no additional facilities. Park Size: 33,077 hectares for the park and 353 hectares for the protected area. During early or late season campgrounds are accessible, but may not offer full services such as water, security, firewood, etc. Campground gates are closed during the off-season. Note: Opening and closing dates are estimates and are dependent on weather conditions and snow pack. Campgrounds are open as early as snow conditions permit and closed when access is not guaranteed. Usually open mid June until mid October. Please contact Park Operator for further information. All surface water must be treated, filtered or boiled prior to consumption. Dogs are not permitted in Cathedral Provincial Park. Please be aware of these camping ethics. Cathedral Lakes Lodge Ltd. operates a lodge and cabins on Quiniscoe Lake and provides transportation by four-wheel-drive from Ashnola River to Quiniscoe Lake (for a fee). National Topographic Series Maps Sheet 092H/01 (Ashnola) at a scale of 1:50,000 covers the Cathedral Lakes area. Grimface, the Matriarch and Macabre Tower offer mountaineering opportunities for experienced climbers. The lakes in the park are not stocked by the provincial hatcheries but they still support healthy populations of rainbow and cutthroat trout. This can be attributed to the abundance of spawning habitat in streams and along the lakeshores. In the fall, spawning trout can often been seen from small footbridges as the trail crosses the outlets of Ladyslipper Lake, Pyramid Lake and Lake of the Woods. Ladyslipper is reputed to have the best fishing in the park. Though the fish are generally small (6-10 inches), they are plentiful. No special restrictions apply. Anyone fishing or angling in British Columbia must have an appropriate licence. There are several well-defined hiking trails in this park. Hikers will require at least a full day to hike one-way into the core area. For your own safety and preservation of the park, obey posted signs and keep to designated trails. Shortcutting trails destroys plant life and soil structure. Horseback riding is only authorized by letter of permission into Twin Buttes and Haystack Lakes. There is no camping at the lakes, only at Twin Buttes. Maximum group size is four people and six horses and the maximum stay is three nights. Users must bring pelletized feed and hobble and move their horses regularly to prevent overgrazing and trampling. Access to Snowy Protected Area from Ewart Creek to the Juniper Creek Junction is permitted with no letter required. The Core Area is closed to horses. Cathedral Provincial Park is open to the discharge of firearms from August 25 to April 15. The Core Area of the park is closed to the discharge of firearms. Hunters are permitted to carry unloaded firearms or bows only when in transit to an open area outside the Core Area during lawful hunting season. Please check the BC Hunting & Trapping Regulations Synopsis for more information. Horses are only permitted from Ewart Creek to Twin Buttes and their use requires a letter of permission. Although you can swim here, be aware that the lakes are glacier fed and the water is very cold. There are no lifeguards on duty at provincial parks. There are no viewing platforms but the scenery in the park is spectacular wherever you go. Hiking along the rim offers 360 vistas of the Cascade Mountains and the Okanagan Mountain Range. The peaks of Manning Provincial Park can be seen in the distance on clear days. 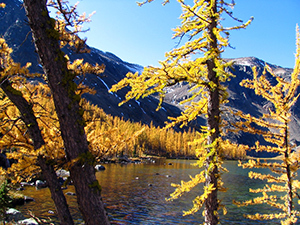 The trails up to the rim travel through mixed forests of beautiful larch that turn golden in the fall. Stone City, the Giant Cleft and the Devil’s Woodpile are fantastic rock formations that highlight the unique geology of the park. Contact Cathedral Lakes Lodge for more information on their facilities. There are no public cabins in the park. The ranger cabin at Quiniscoe Lake is for staff only. This is a wilderness area and visitors must be prepared. Freezing temperatures and snow can occur in any month and campfires cannot be relied upon for cooking or as a source of heat. Campers must bring portable stoves for cooking. Fires are prohibited at Lake of the Woods and Pyramid. Firewood can be purchased from the Park Operator in some parks or you can bring your own wood. Fees for firewood are set locally and may vary. To preserve vegetation and ground cover, please don’t gather firewood from the area around your campsite or elsewhere in the park. Dead wood is an important habitat element for many plants and animals and it adds organic matter to the soil. You can conserve firewood and air quality by keeping your campfire small. Cathedral Lakes Lodge offers day-trips into the Core Area driving up from the Ashnola at 8:00am and returning at 3:30. This park offers limited vehicle accessible campsites on a first-come, first-served basis. To access the Lakeview Trailhead campground, turn left at 13 km on the Ashnola Forest Service Road. Another 500m down this dirt road is the gravel trailhead parking lot. There are three walk-in sites along the river downstream from the footbridge. The sites are within 20 metres of the parking lot and are rustic, having only fire rings and no picnic tables or constructed tent pads. Two pit toilets are on the other side of the parking lot. Overnight parking is permitted for self-contained units. The sites are used most often as an overnight stop by people intending to hike into the Core Area and wanting an early start. Buckhorn campground is two kilometres further west along the Ashnola River almost at 16 km and the sites are maintained by a Park Operator. There is a limited number of picnic tables, fire rings and 2 pit toilets. Camping within the park’s core area is restricted to designated sites near Lake of the Woods, Pyramid Lake and Quiniscoe Lake. All sites are first-come, first-served. Sites are usually accessible from June to September. An information shelter is located between the private lodge and the ranger cabin. At this shelter are self-registration envelopes and a metal vault. Upon arrival, campers should fill out the registration form and deposit their fee in the vault. This is for all three camping areas. To reduce the visitor impact on the park, please view the following camping ethics. Quiniscoe Lake has 30 sites designated by number posts. The sites are spread out along the southern shore of the lake amongst Engelmann spruce, Lyall’s larch and Sub-alpine fir. Boulders and rock outcroppings are strewn about the area, evidence of the area’s glacial history. The sites feature framed earth tent pads to minimize the impacts of camping by keeping people in designated areas. The sites are grouped together in clusters of three or four in order to share the 12 picnic tables and 13 fire rings. There are four pit toilets in the campground, one is near the lodge access road, a second is behind the ranger cabin between sites 4 and 7 and the other two are further along the lake beside the trail to sites 21-25. A firewood corral is located near the lodge access road approximately 100m from the campsites. Campers are reminded to conserve firewood. There are four wire mesh food caches on the ground to protect supplies from rodents and birds. They are not bear proof. Lake of the Woods has 28 sites with framed earth tent pads along the northeast shore of the lake amidst smaller fir and larch trees. As a result, the sites are more open and less shaded than at Quiniscoe. The terrain is similarly rocky. This is a more rustic campground with two pit toilets and no tables or fire rings. Fires are prohibited. The location of the sites affords spectacular views of Lakeview, Pyramid and Quiniscoe Mountains, as well the jagged peaks of Grimface Mountain, the Macabre Tower and the Boxcar. There are no food caches available at this campground. Pyramid Lake is the smallest and quietest of the campgrounds with 12 sites. The lake is nestled between the two sloping flanks Pyramid Mountain. The sites are in a thicker forest of large spruce similar to Quiniscoe. Some of the sites are located on a point overlooking the lake. The sites have framed earth tent pads but no tables or fire rings. There are two pit toilets and two wire mesh food caches. Wilderness, backcountry or walk-in camping is allowed. No facilities are provided at these sites. Backcountry fees are collected year-round, and payment can be made online up to 2 weeks prior to your arrival through Discover Camping, for Lake of the Woods and Quiniscoe Lake only.